It struck me that this ensemble would work well with not only a tube skirt (on my wish list - see below) but also with black harem pants. Since harem pants, with the dropped crotch, have something skirt-like about them. Don't you think my dog Maggie, with her sweet face, provides some necessary softness to this hard edge outfit? I'm continuing to love Spring because I can still wear pants, but with sandals if I feel like it. These outfits look rather hard edge to me with all of the black. But still I felt age appropriate so, happy with the results. Yes I still worry about that, not wanting to be the fool but wanting to push the envelope a little too. It's a fine line, isn't it. 1-2 The silky sweatshirt that Angie blogged about recently. Angie picked this top in 2012 from Zara and I jumped on it. Haven't worn it much because I fear it's not too flattering but I got a compliment from a woman standing in line at the Costco food court ($1.65 sundae). She said people who wear leopard have a lot of confidence. I told her, it was only in some areas of my life where I felt confident! The sweatshirt is worn with: Rag & Bone skinnies in Kensington wash, Vic Italy booties, Zara leather jacket also 2012, and Alexander Wang-esque bag from UO. I got it in their SF store, it's made from re-cycled leather and has so many pockets that I call it my Lumosity bag. 3. This was a WIMW a few weeks ago, and this time I actually wore it to an open mic night. It's fast to put together and my boyfriend thought it looked rock and roll. I thought, more art gallery opening in NYC due to the lack of leather, but I'll take it. 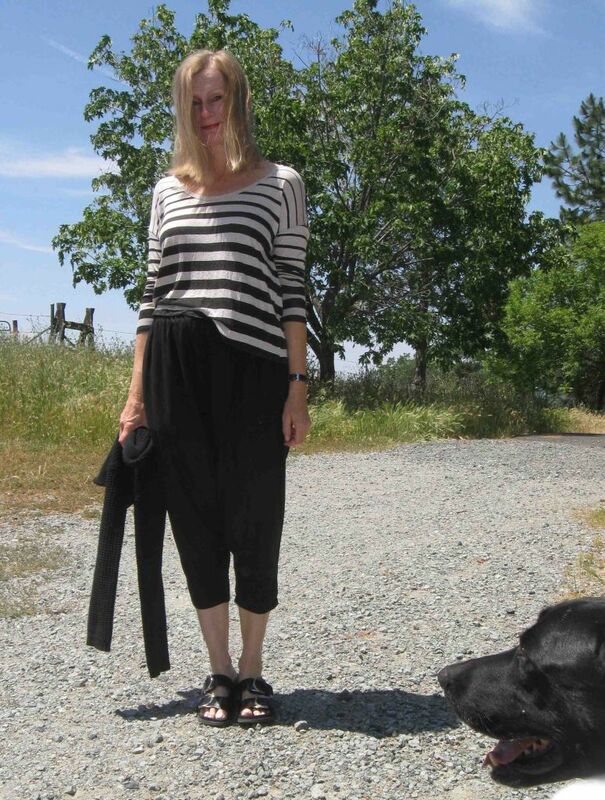 UO knit harem pants worn with: UO sweater, Raquel Allegra tee, Steven sandals from 2010. I think they still look current. If you are interested in the UO harems, they are very cheap now. Regarding the negative review, if you size up there is no discomfort at all in the waistband. TFLAC = Thanks For Looking and Commenting!